There is no possible way to say this enough times: great graphics don't make great games. Perfect Dark Zero looked like a Titian, but it was a snooze. 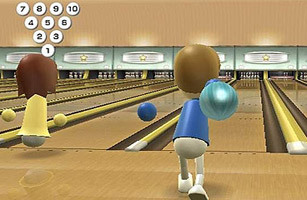 Wii Sports  a mini-sports anthology that includes golf, boxing, tennis, baseball and bowling  looks like Colecovision. The little guys on the screen don't even have arms. But it's hilarious, and it shows off the power of the motion-sensitive Wii controller to put you right in the game, sweating and yelling and trying crazy spins and lunges and angles. The tennis game alone is worth the price of admission. Which is nothing, since it comes free with the Wii.